Professional traders are well aware of the fact that an increase in a stock's option volume is often the precursor of a move by the underlying stock itself provided you can "screen out" extraneous option activity. McMillan's Daily Volume Alerts scans for these opportunities on a daily basis and delivers trading recommendations along with valuable market insights to your inbox each morning in a concise newsletter format. The Daily Volume Alerts is delivered by email every trading day around the market open. It includes a daily list of where "hot" option action is taking place, plus daily readings on our proprietary stock market oscillators (including the powerful "stocks only" oscillator). Stock and option picks are generated by observing unusual option trading volume, often a precursor to large moves by a stock. Subscriptions to the DVA include daily market commentary, specific trading recommendations, follow-ups and updates to active recommendations, daily NYSE-based and "stocks only" Oscillator readings, an Option Volume Alert Report for options traded the previous day, high implied volatility stock lists, and a report on stocks with extraordinarily strong volume. 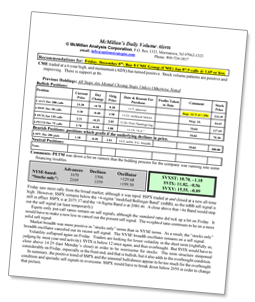 McMillan's pre-market analysis on the major market indices using a range of proprietary technical indicators. Trading recommendations based on observation of unusual option volume, technical analysis, and some of McMillan's favorite trading systems. Includes follow-up action, trading stops, position analysis, and a recap of what happened with previous recommendations (if there were any). Daily NYSE-based and "stocks only" Oscillator readings. Daily evaluation of stocks with unusual option activity. An increase in the trading of a stock's options over the normal daily volume is often a precursor of movement by the stock itself. This is especially true in advance of news items, such as earnings reports or takeovers. If there is unusually high volume in CALLS, then we look for a spot to buy the stock; if there is unusually high volume in PUTS, then the stock may be either a potential buy or a potential (short) sale. The reason that heavy put volume may be interpreted as either bullish or bearish has to do with the fact that, if insiders are buying calls, it may force market makers to trade puts as a hedge. Thus a bullish situation could conceivably have heavy option volume in both the puts and the calls. Note that we said buy the "stock", but in reality many traders prefer to buy the short-term, in-the-money options. These options have the least time value premium and will most closely mirror the movement of the underlying stock. You would buy calls for "buy stock" recommendations, and you would buy puts whenever we have a "sell stock" recommendation. So, wherever we say "stock" in this report, you may want to substitute "in-the-money option" as you are reading it. We generally state which option we feel is the best one to buy when the initial recommendation is made. This service highlights situations in which a stock's options trade in volume at least double the "normal" amount. It is intended for serious traders who are involved on a daily basis, and have the discipline to exit losing trades quickly. We do our best to eliminate situations in which the option volume is increased by spreads or by covered writes in a particular series, for these patterns are NOT at all indicative of an impending stock move, but obviously not all of these situations can be eliminated. Note: this is NOT a contrary indicator. If there is excessively high activity in the calls, we will respect it and look to buy the stock. Similarly, if there is high volume in the puts, we look to sell the stock. Lawrence G. McMillan developed the computer screens that "weed out" the most attractive candidates recommended in the DVA. It is important to realize that this is not merely a list of which options are the most active. Those "active options" are generally not where the smart money is operating. Rather, we compare the current option volume with the normal option volume. Then, we eliminate those situations where option activity has increased due to immaterial factors such as spread trading or covered call writing. After these screens have been made, there is a good chance that a trading candidate has been discovered. Sign up today and spot takeovers and earnings surprises before they're announced. If you are not completely satisfied with your subscription, you may cancel at any time and a prorated refund will be issued based on the remaining unused portion of the subscription. Trial Subscriptions and Paid subscriptions are not renewed automatically unless you choose an "autorenew" subscription. Regular subscriptions will expire upon completion if no action is taken. Performance Results: Past performance results for advisory services and educational products are shown for illustration and example only, and are hypothetical.